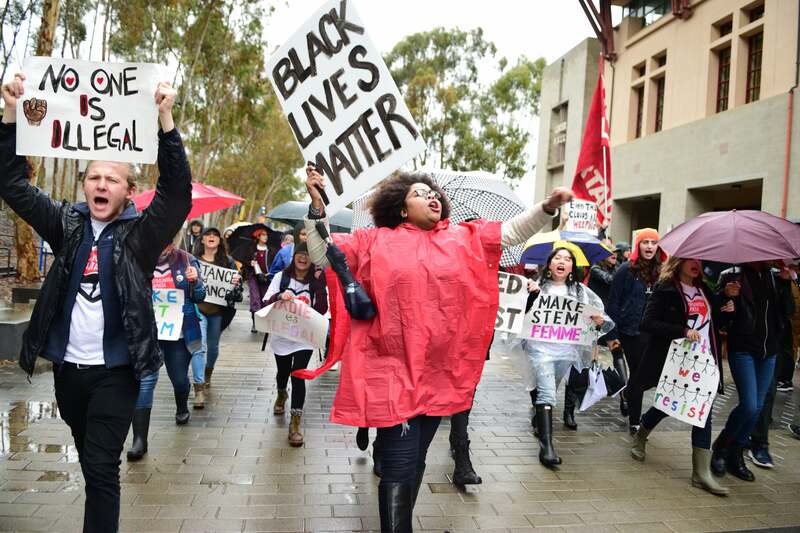 As Donald Trump placed his hand on two bibles, taking the oath of office to become the 45th president of the United States, around 60 student protesters at UC San Diego organized in the rain at the Silent Tree in front of Geisel Library holding signs, shakers, megaphones and flags. The march and walk out, organized by the Lumumba Zapata Collective, an activist group created by graduate students, hoped to declare that students and faculty would not comply with four years of President Trump, and that, despite his official designation, they would not abide by his controversial proposed policies. Protesters marched from the Silent Tree to Peterson Hall, then down Library Walk and onto the crosswalk at Gilman Drive where they circled back and forth, trapping a MTS bus and stopping traffic in all four lanes. Chanting, “Hey, hey, ho, ho, UC fascists got to go,” and “No fascist USA, no Trump, no KKK,” protesters eventually caused bus lines and shuttles to avoid campus altogether, instead dropping students off at La Jolla Village Square, nearly a mile from campus. Police officers barricaded the area where the protesters were blocking the road, and escorted trapped vehicles out of the deadlock. Nearby, five people stood with UC IDs hanging from their necks. 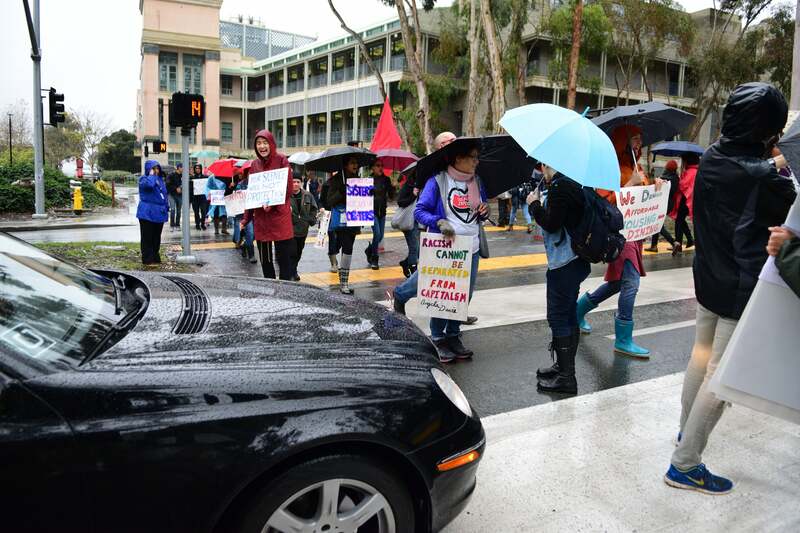 One of them was Dean of Student Affairs for Eleanor Roosevelt College Patricia Scott, who said they were stationed there to ensure the safety of both protesters and non-protesters. According to one upset protester, one of the UC officials tried to persuade her to let people through the human barricade. Davide Carpano, a second year Ph.D. student studying sociology, told the Guardian that it was not just Trump’s inauguration he was protesting by marching with the Lumumba Zapata Collective, but the lack of representation for all. From the Old Student Center, protesters moved to the medical school across Gilman Drive, then to Warren Mall where Tim Hawkinson’s “Bear” sculpture stands. There, students and faculty from STEM departments joined their ranks as they moved toward their final stop, Matthews Quad. In Matthews Quad, the march culminated with protesters, event speakers, and individuals celebrating Trump’s inauguration converging in one space. Trump supporters wore “Make America Great Again” hats and waved American flags as protesters chanted beside them. Sam from UCSD College Republicans spoke to the Guardian about his reasons for demonstrating with his fellow republicans in the quad. “We are just here to celebrate the successful transition of power, the peaceful transition of power, which I think all Americans should be happy about,” he said. Sam explained that being a republican on UC San Diego’s left-leaning campus has gotten easier after the election. When asked about claims that Trump is misogynistic and racist, Sam denounced them and turned his focus to the protesters who still chanted around him. Sam also expressed dismay with the methods anti-Trump protesters used to make their grievances known. The protest mostly dissipated in Matthews Quad after hours of chants and speeches by Lumumba Zapata Collective speakers. But at the time this article was published, there were still groups of activists having discussions in the rain. Nate Walker contributed to this report. Why is the most extensive quote from someone who wasn’t mobilizing and isn’t a member of LZC?